Former Italy and South Africa coach Nick Mallett believes England must use the Six Nations to decide what style they want to play, with the World Cup looming on home soil later this year. 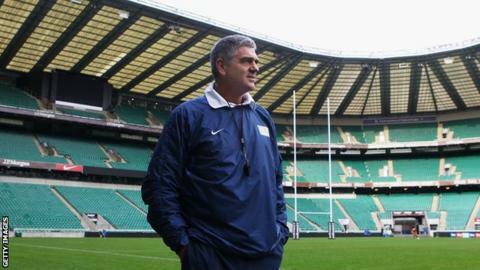 Mallett was interviewed by the RFU for the job of England head coach before Stuart Lancaster's permanent appointment in 2012. "A coach has to have clarity," Mallett told BBC Radio 5 live. "Stuart Lancaster has to understand what he wants out of his backline." But Mallett added "there is still time" for Lancaster to decide how England should play, adding "this Six Nations will be definitive for a lot of reasons". England have the players to definitely make a semi-final and possibly the final. But they really need their world-class players to be fit. If they are, I can see them finishing top of their pool. I would say a South Africa v New Zealand semi-final in one side of the draw, and England v Ireland in the other. But South Africa have a very tough quarter-final draw, because whoever comes second in England's pool is going to be a very good team. So if South Africa win this World Cup we will have done it the hard way. "England have always had a great set of forwards and have done incredibly well with a kicking fly-half, and yet they have flirted a lot with the New Zealand style of play, and then backed off from it when it hasn't worked," he explained. "The style of play England produce in the World Cup will be determined by how they do in the Six Nations. This is something England need to define rapidly." England's injury worries are mounting ahead of the Six Nations opener against Wales on Friday, 6 February, with midfield options Brad Barritt and Kyle Eastmond both set to miss out after being injured at the weekend in European Champions Cup action. Fly-half contender Owen Farrell is out for the entire tournament, along with number eight Ben Morgan and lock Joe Launchbury. But England's main loss - according to Mallett - is centre Manu Tuilagi, who may not feature in the event because of a groin injury. "Tuilagi is a force of nature, and you only get one or two of that type of player in a generation," said Mallett, who guided South Africa to a world record-equalling 17 successive Test wins from 1997-98 and will be working with Accenture to provide statistics during the Six Nations. "He is so important, there is no question of that. If you have a Sonny Bill Williams or Julian Savea (New Zealand backs), or a Tuilagi, you have got someone who all the other players can feed off and play off. "I haven't yet seen another player of that physicality in the England set-up. Luther Burrell is a very powerful, strong, player, but he's manageable. Tuilagi is not manageable. When he gets the ball on the front foot he's devastating." Hear more from Mallett on BBC 5 live Rugby on Thursday, 29 January, from 1930 GMT.